But the release was scant on details, failing to reveal the government officials and private sector business people making the trip with the territory’s leader. In fact, the release gave more information about U.S. Ambassador to China, Max Baucus, than it did about the trip itself and Mr. Mapp’s itinerary. The governor’s trip will commence with a meeting with Mr. Baucus and U.S. Minister Counselor for Commercial Affairs Sarah Kemp. According to the release, companies whose officials the governor is set to meet with include Arclight, Sinopec, Fosum Group, Air China and China National Tourism Agency. As previously revealed, Mr. Mapp will visit Beijing, Ningbo and Shanghai. Upon inquiry, Government House recently made known to The Consortium that sixteen people — ten government officials, including the governor, and six persons from the private sector — would travel today on the business trip. “Those private sector representatives will be paying for themselves, and the individual G.V.I. [Government of the Virgin Islands] departments and agencies will be paying for their own representatives,” Government House Communications Director Cherie Munchez said. During the first announcement, Mr. Mapp said he would take with a delegation that includes Dept. of Tourism officials, tax and trade officials, members of his office, the two presidents of both the St. Croix and St. Thomas Chamber of Commerce, along with any senator who’d like to attend. “This mission is to work along with Sinopec who has very serious interest in making additional significant investments on the island of St. Croix. The plan here is to visit a number of their additional storage terminals and refining facilities, to discuss additional and limited refining at the St. Croix site; to discuss areas where we plan to breakdown the current refinery and begin in that area to stage the transshipment of goods coming from China to the West and goods from the West to China,” Mr. Mapp said. He continued: “That trade mission will include meetings with Air China to discuss weekly or by-weekly flights to the island of St. Croix, to bring Chinese tourists similar to what we’re doing with the Danish tourists on the Norwegian Airlines. The plan is also to discuss — and hopefully to save the Virgin Islands Government some money — the possibility of a hotel project on the big island as well. “The plan is to create more jobs, to pursue more investments on the big island, to expand tourism and flights to the territory, and to bring another diverse group of individuals who have the financial wherewithal to make the investments in the territory,” the governor concluded. 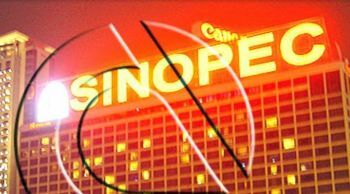 The trade mussion is a big deal because Sinopec is one of the most powerful companies in the world. Its financial reach surpasses that of many governments, and it has connections that intertwines well past the oil industry. The firm has 358,571 employees based on 2015 numbers. Its total assets stand at a value of 1.451 trillion, and the firm has branches all over the world, including Canada and the U.S. In the governor’s absence, Lieutenant Governor Osbert E. Potter will serve as governor.